The interim report on the future of the state pension age (known as the Cridland report, after its author, John Cridland) dropped last week. This is a 100-page, 30 thousand word report, so I have saved you the time and trouble of reading it. The good news is that it’s got plenty of graphs, which should make the journey a lot less painful. The State Pension is funded on a “pay as you go” basis, with contributions from today’s workers paying the pensions of today’s pensioners. This means that rising life expectancies and changing demographics put this funding under pressure. 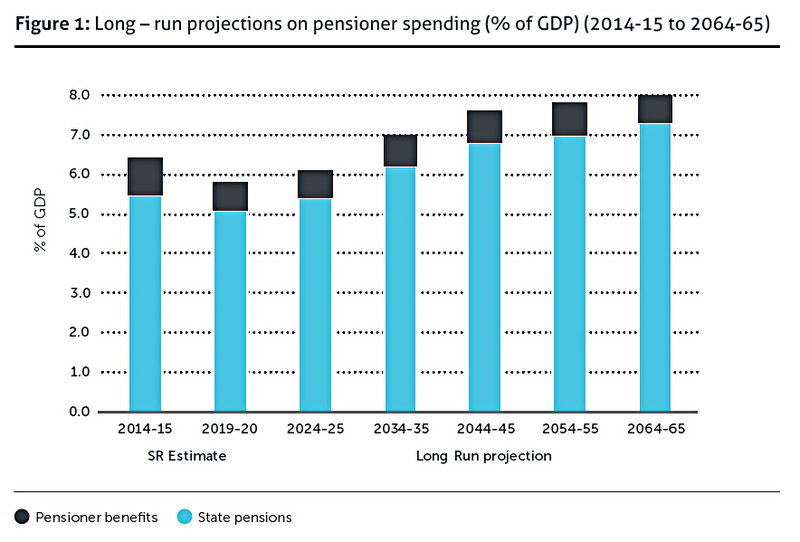 The aim (as stated by the Pensions Commission) is to keep pension spending to below 8% of GDP. 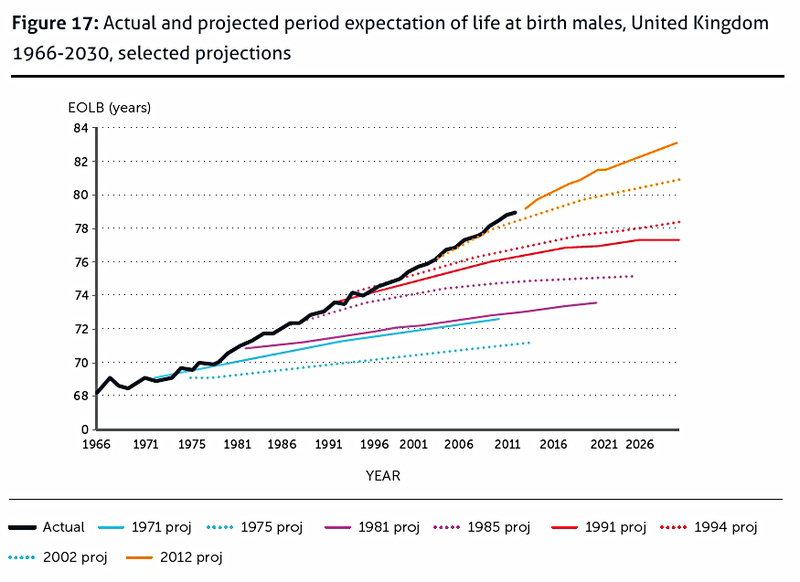 The report was George Osborne’s idea, to take account of rising longevity in the UK. In the 2013 Autumn statement, he introduced the principle that people should expect to spend on average “up to one third of their adult life in receipt of the State Pension”. Using some round numbers, if we assume adulthood at 18 and life expectancy of 84, that gives 66 years as an adult. One third of that is 22 years on the pension. Which would mean that the pension should kick in at 62. I’m down to get mine at 66, and things will only get worse from here. So that particular sound-bite doesn’t stand up to the “back of an envelope” examination. Apart, perhaps, from the “up to” bit. The final report will not interfere with any arrangements up to 2028. The new flat rate pension is around £8K for those with 35 years of National Insurance Contributions (NICs), and is designed to remain above the means-test for welfare support. Note that other groups with interrupted working lives (such as carers) typically receive NIC credits to top-up their pension entitlements for years where they made no contributions. In addition, older people with DC pension pots have been allowed direct access to them through the Pension Freedoms, replacing the historical requirement to convert to what are now extremely poor-value annuities. And finally, workplace pension auto-enrolment is moving down to the smallest of firms, though contributions are not currently planned to rise beyond an entirely inadequate (and voluntary) 8% pa.
A lot of pension maths is driven by demographics and life expectancies, so a good deal of the report is taken up in discussing this. Part of this discussion will involve comparisons between the UK and other OECD countries. The report is organised around what it describes as the “Three Pillars” – affordability, fairness and “fuller working lives”. I predict right now that we could fall out over what constitutes fairness – it’s one of those words that means something different to everyone. 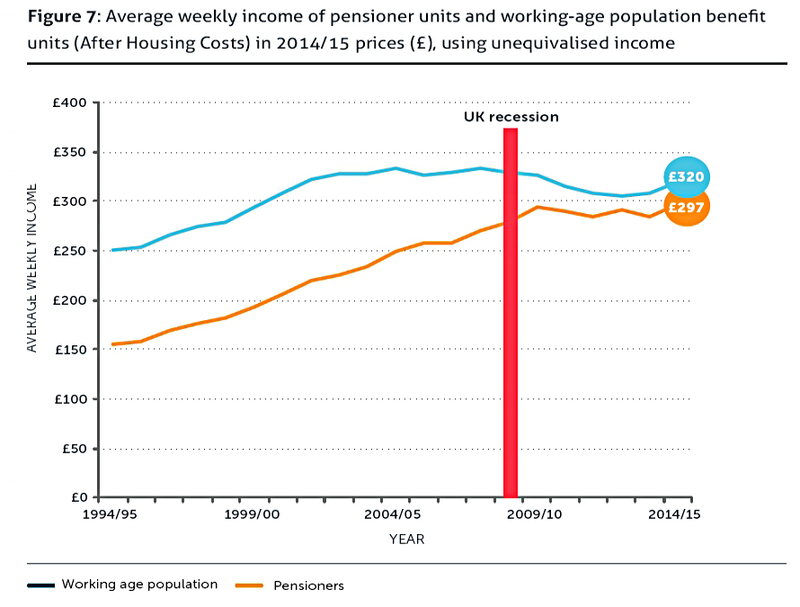 The analysis of affordability will revolve around dependency ratios (pensioners to workers). Fairness will include both intergenerational fairness and intragenerational fairness. 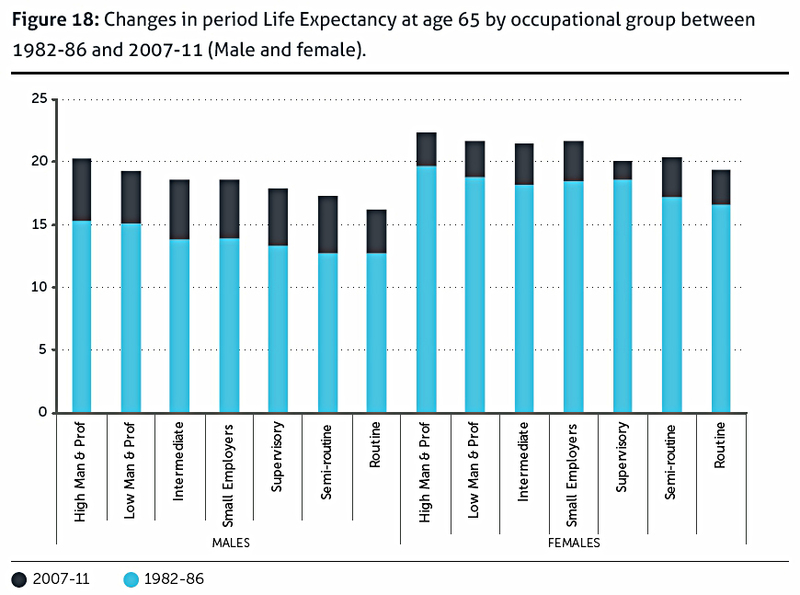 Fuller working lives seems to mean Longer Working Lives, and some consideration of a phased approach to retirement (perhaps via part-time work, or early access to a reduced State Pension). That doesn’t look too bad to me. Projections into the future necessarily require a few assumptions, which become less accurate the further out into time we go. For this reason, we are scheduled to have one of these State Pension reviews during each parliament (ie. every 5 years). The report takes stats from the Office for National Statistics (ONS) and the Office for Budget Responsibility (OBR). In the opinion of the report’s authors, all these groups “have difficulty accruing sufficient private pensions savings”. Since all groups in society are likely to receive similar amounts from the new State Pension, this will translate into lower retirement incomes for the SIGs. I won’t have space to consider these groups in detail, except where the report makes specific proposals for their pension provision. 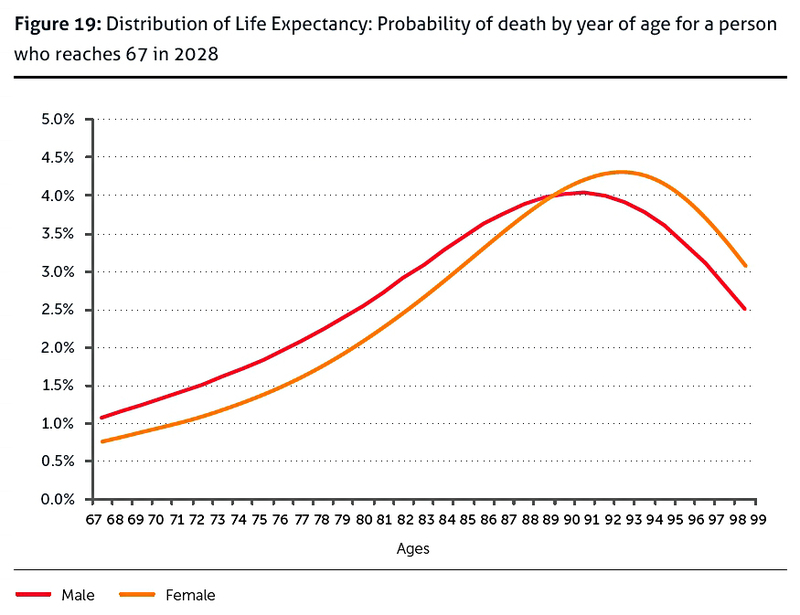 The average age is set to rise from 64 years to 65.5 years by 2060. 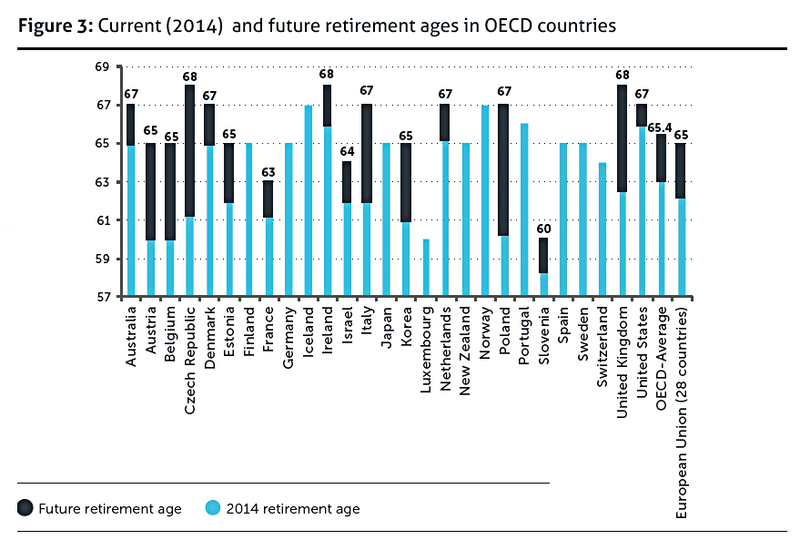 The UK will have the highest retirement age in the future, though Italy has more aggressive planned increases. Gender equalisation is scheduled everywhere except Chile, Switzerland and Israel. There is also a general trend away from early retirement, apart from certain occupations like army, police, firemen and trawlermen. I’m at a loss as to how the latter two can help, since incentives to work longer must cost the state more overall when averaged across the population (or else they are not genuine incentives). They may delay payments from the state for a few years, but over the lifetime of the pensioner, more must be paid out for it to work as an incentive. I recommend that we focus on the first two points. The ratio gets worse in all cases, though rises in the SPA will soften the impact. One of the drivers of the cost of the State Pension is the Triple Lock – the commitment to raise pensions by the greater of inflation, wage increases or 2.5%. Over recent years this has mostly lead to the State Pension recovering the value it lost in previous decades when it wasn’t linked to earnings. This is not surprising, given flat earnings since the 2008 financial crisis vs the Triple Locked State Pension. The UK pension is still one of the lowest in Europe, and significantly below both the minimum wage (now heading towards £16K) and the welfare benefits cap (£20K outside London). Despite this, there are now calls to remove the Triple Lock. It’s less likely that the Triple Lock will survive beyond around 2047, but that’s a long way off yet. Not much to worry about there. 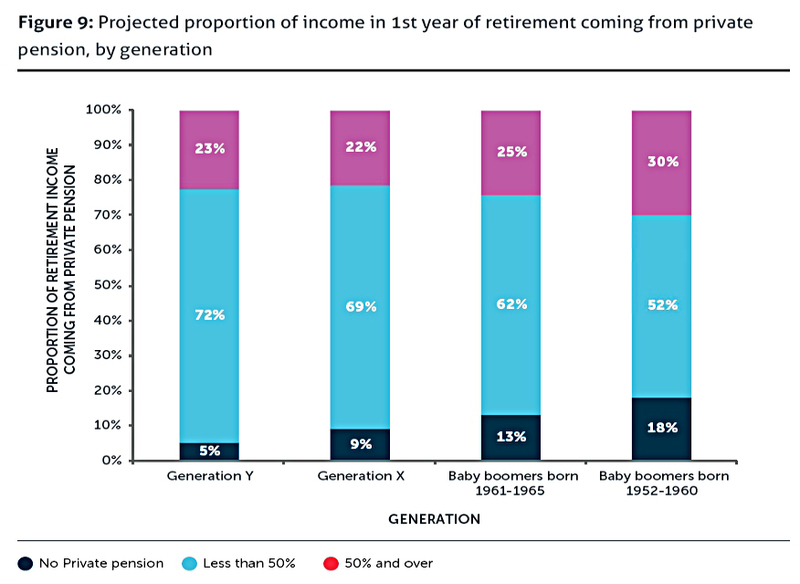 Even though the chart is drawn the wrong way round, and is therefore misleading, each subsequent generation will have a higher pension income than the one before. This is not an intuitive result, largely because of the uneven distribution in pension income in the early baby boomers. 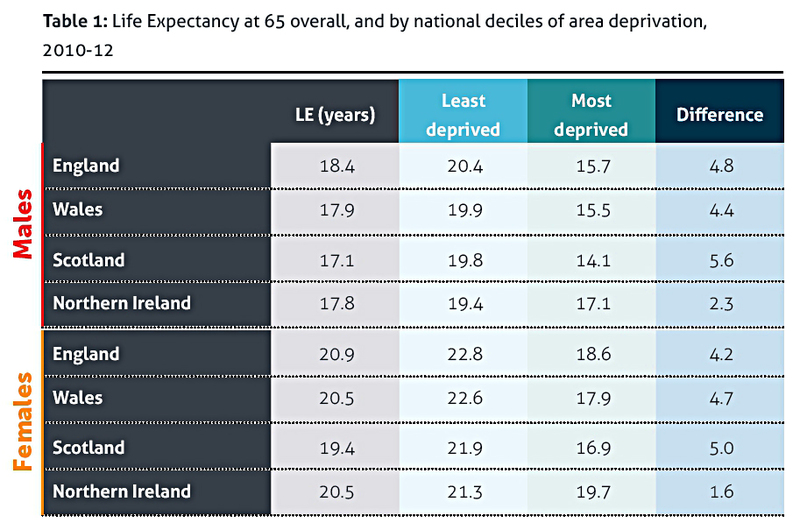 This cohort includes a lot of well-off pensioners – with generous DB pensions – who feature regularly in the media, but also a lot of poorer pensioners (without DB pensions) who are more overlooked. The chart above shows median values for each generation. One thing that none of this analysis includes is the dramatic changes in the housing market over the past 20 years. Most boomers have no mortgage and a lot of equity, so can spend their pension income without worry. 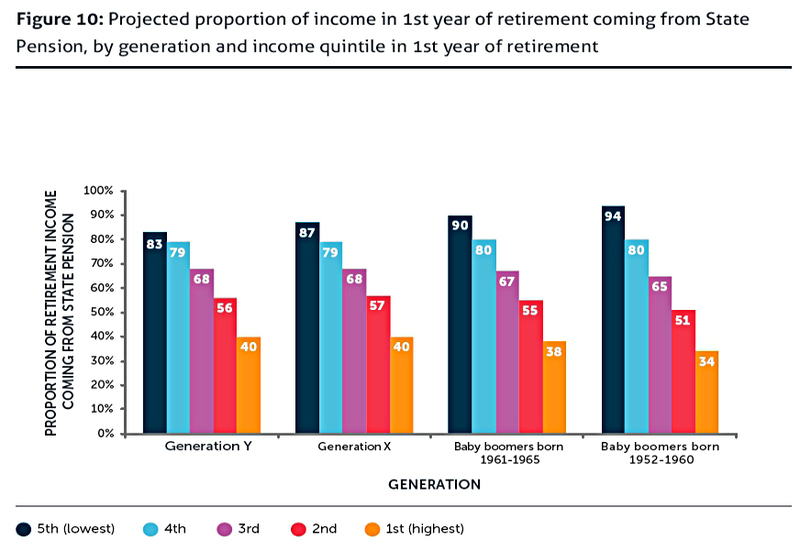 It’s not clear that subsequent generations will be in such a favourable position. The adequacy of pensions is usually measured against replacement rates, which measure the percentage of working income that the pension should match. As shown in the table, these rates decline as you go up the income scale, from 80% at £12K pa (equivalent to £9.6K pa) through 60% at £40K (£24K) to 50% at £60K (£30K). 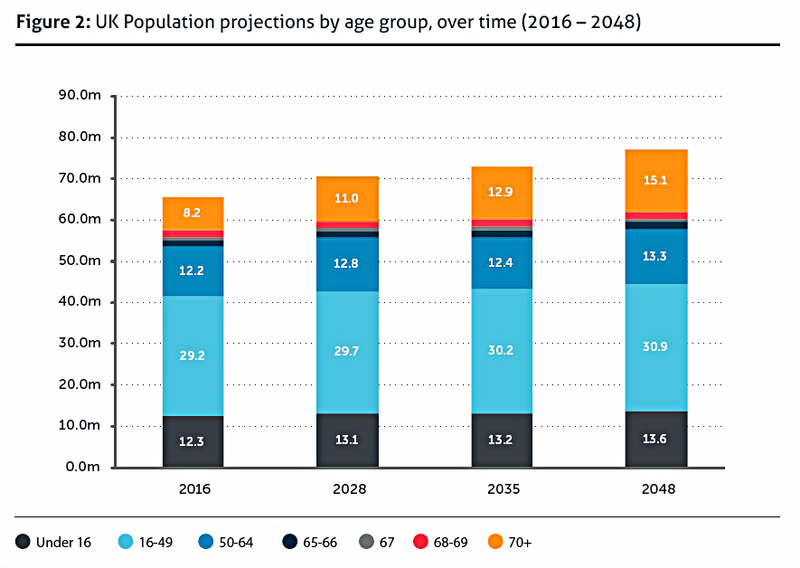 Working out whether these targets can be met has become harder since the pension freedoms, since annuity rates are no longer an appropriate measure of the income available from a pension pot. 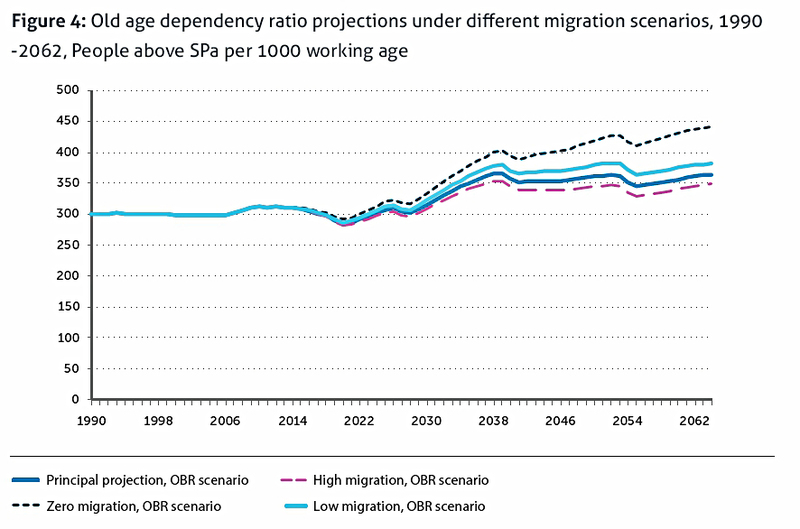 Working out whether the targets are reasonable is also harder, since housing costs in retirement may well be higher for future generations. 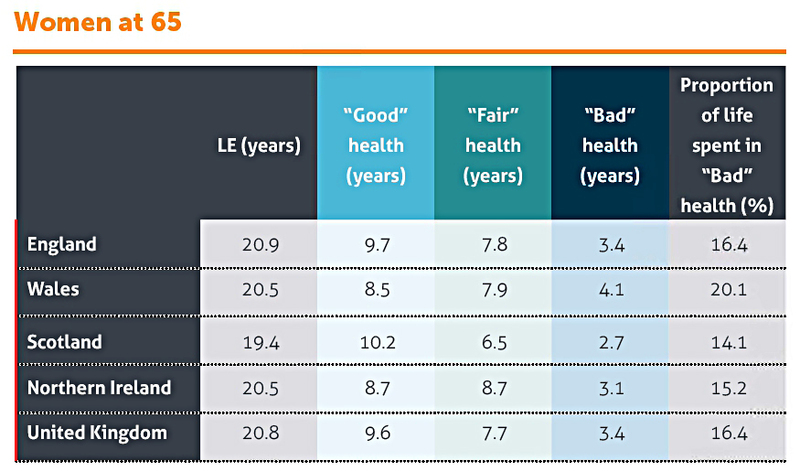 Richer people are more likely to retire early. There is also a tendency for “burn out” in manual and knowledge occupations, as well as front-line crisis jobs (eg. ambulance workers). I’m not clear how the SPA would be used to encourage these groups to work for longer, or even why the government wants this to happen. 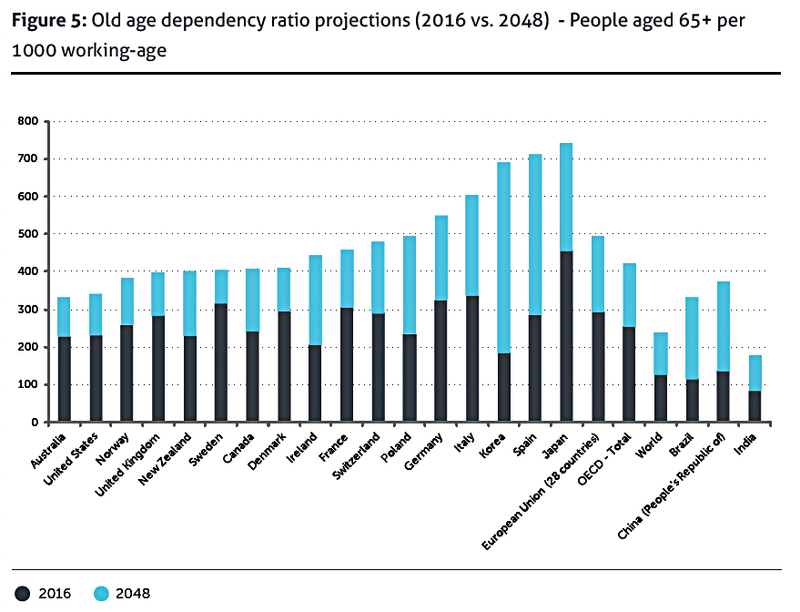 It would improve the dependency ratio stats a bit, but would it improve the lives of those concerned? This seems to me to be a marginal issue for the final State Pension Age Review report. 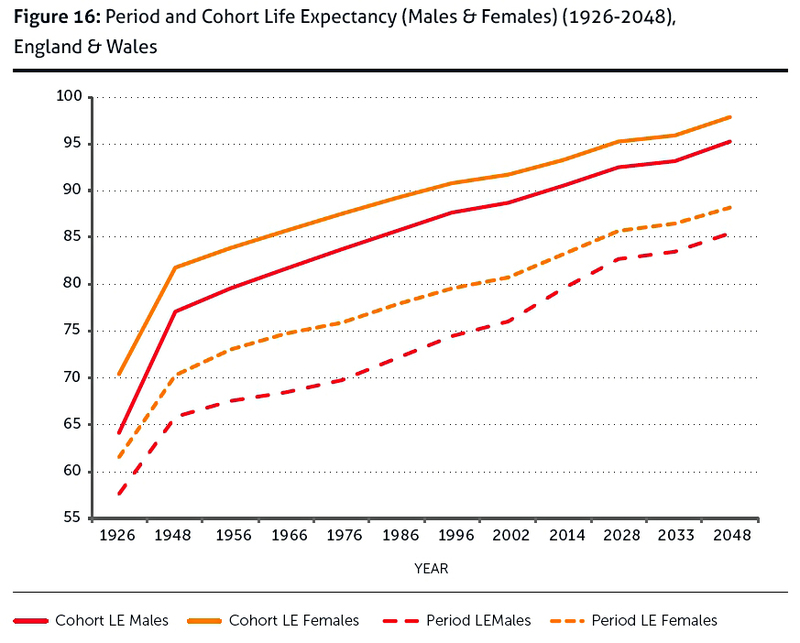 Life expectancy (LE) has increased dramatically in the UK. For those born in 2016 it’s now 90.6 for men and 93.5 for women. 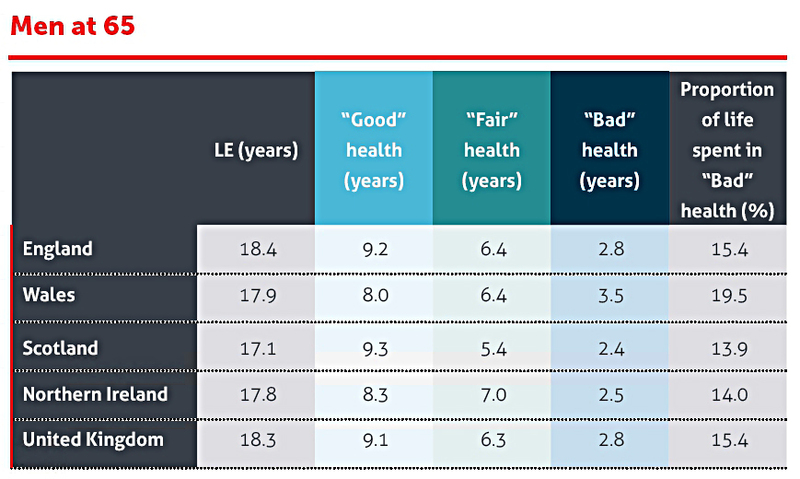 Cohort life expectancy (CLE) takes into account expected improvements during a person’s remaining life, rather than just taking a current snapshot. CLE for a 65-year-old man has increased from 12 years in 1948 to 21.3 years (in 2014). 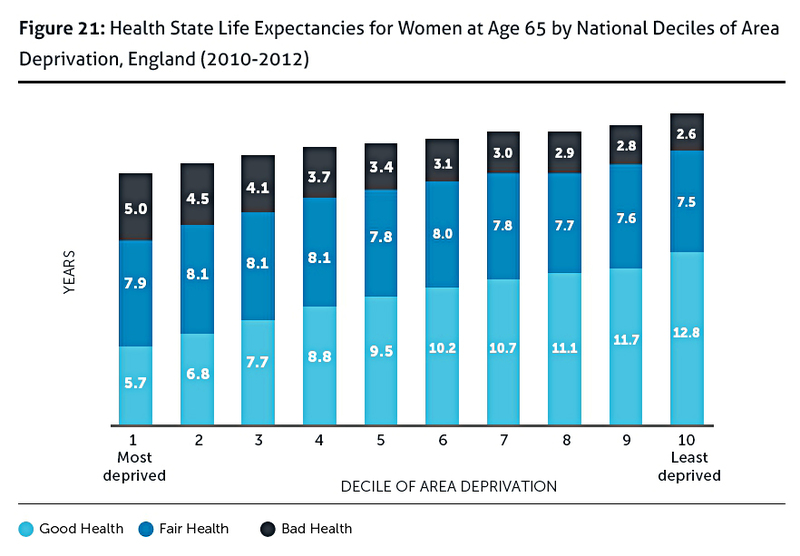 The general perception is that life expectancy varies between regions, but in fact, there are even larger variations within regions. 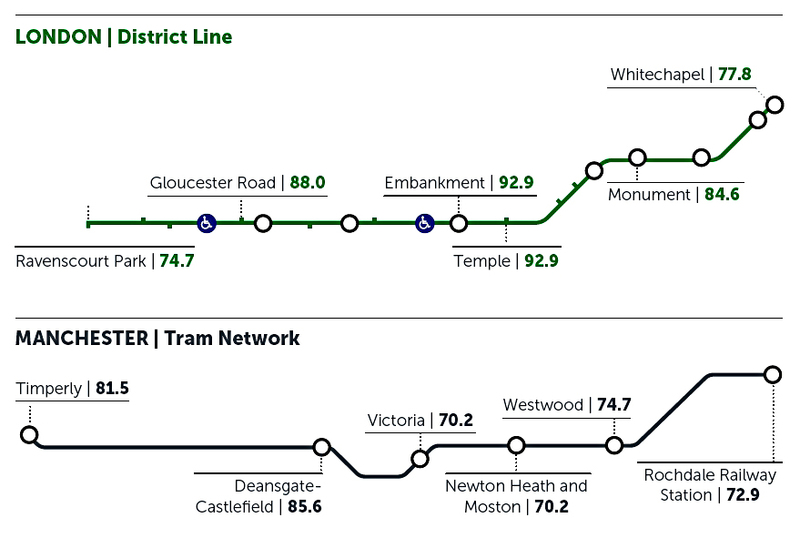 This is particularly relevant for me, since I was born in Rochdale (at the wrong end of the tram line) and now live near a nice tube stop in London. This has probably added 15 years to my life expectancy. Though full of questions and short on answers, this is a much more interesting report than I expected. There’s a wealth of information on how the State Pension is expected to play out over the next 30 years. The lack of a clear forward direction is probably down to the change of government since John Cridland was appointed by George Osborne. 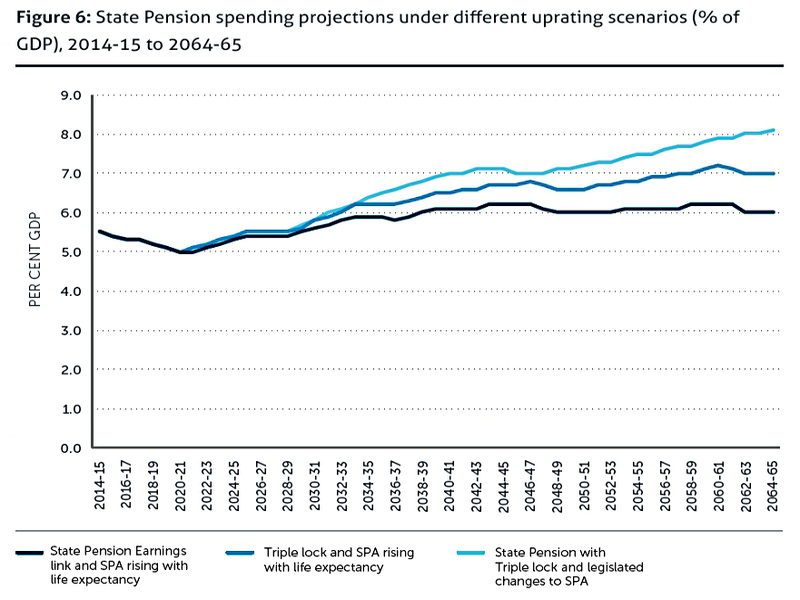 The most surprising finding for me was that even with the Triple Lock, the cost of the State Pension won’t exceed 8% of GDP during the next 50 years. There might be a funding crisis in company pensions, but there isn’t one for the State Pension. The other surprising finding was the extent to which there is little generational impact. 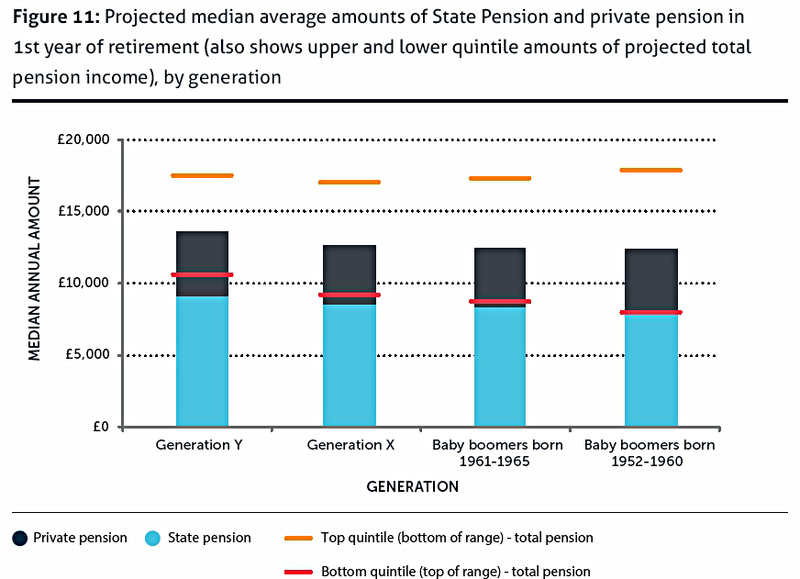 Younger generations in fact do slightly better overall, and have less inequality of pension provision. 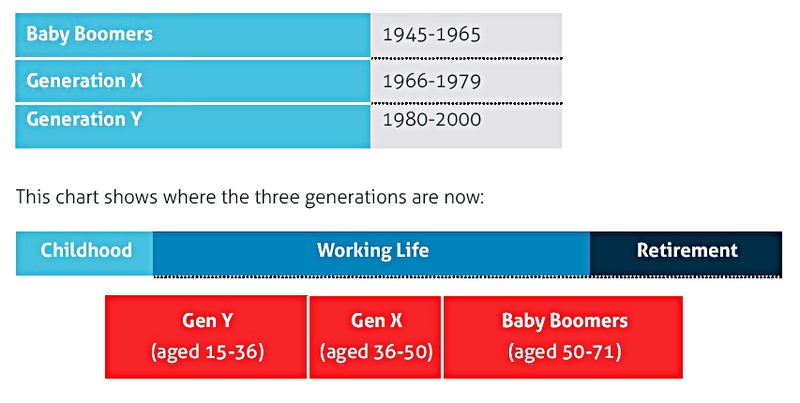 This appears surprising because media coverage focuses on the contrasts between generations today, and sometimes in the past, rather than looking at future outcomes. The recent improvements (like the new State Pension and workplace auto-enrolment) will take some years to bear fruit. It’s also because non-pension factors like expensive housing loom larger for many people. The only worrying aspect of the report are its suggestions regarding the special interest groups it describes as “the most vulnerable”. They are also considering regional variations in the SPA, to accommodate local life expectancy, and also occupational variations to the SPA for similar reasons. These options have been reported in the press as letting the “unhealthy poor” get hold of their pensions before the “healthy wealthy”. I think the regional option is unlikely, since the report stresses that variations within regions can be bigger than those between them. A better alternative would be an early State Pension (say at 60) with a reduced benefit, as would happen with a company pension scheme (both DB, and DC converted to an annuity). The third option they are considering is increasing state benefits for groups like carers, but I think this is unikely. I understand the principle to be that you pay a levy each year you work (NICs) and then you get a payment in return for each year you live beyond a fixed age (the SPA). This inevitably means that those who are richer (and will live longer) will receive more in pension payments than the poor. 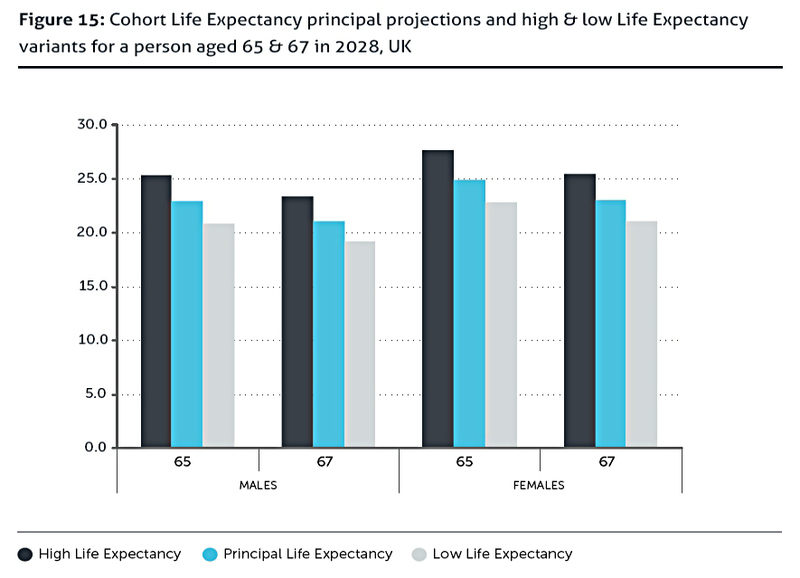 An individual’s health – and therefore life expectancy – is in part a lifestyle issue, and not something that the state should be compensating people for. 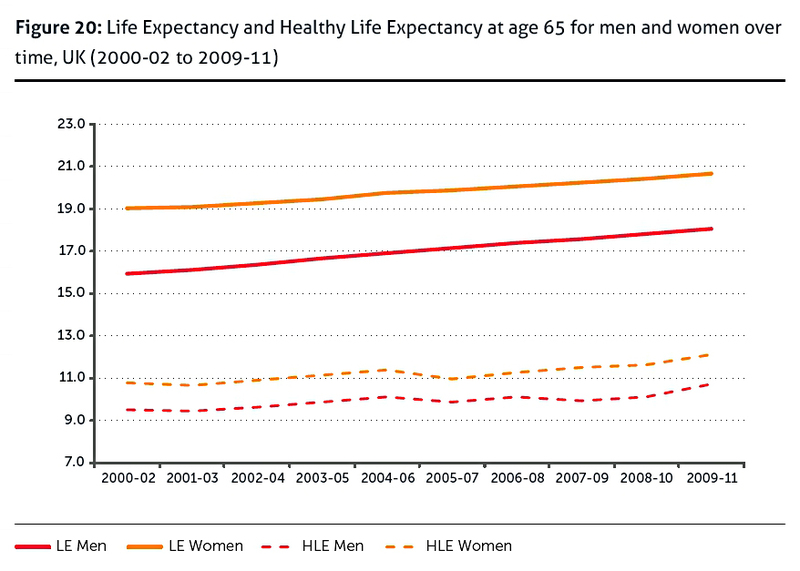 For decades we had the injustice of women (who live longer than men) getting a five-year head start, but that is finally being corrected. Now instead, lager-swilling, pizza-munching, cigarette-smoking exercise- and vegetable-avoiding couch potatoes could get a head start instead. There used to be a Nudge Unit in Number Ten, but the government’s commitment to incentives towards a better life appears to have waned. Any early access to the state pension (which I’m not opposed to in principle) needs to come with a reduced rate of payment, just as early retirement from a private pension would. Thanks for this summary. I too was surprised at the fact this didn’t support the media reports of the evil baby boomers eating their children, at least in respect of the State Pension. 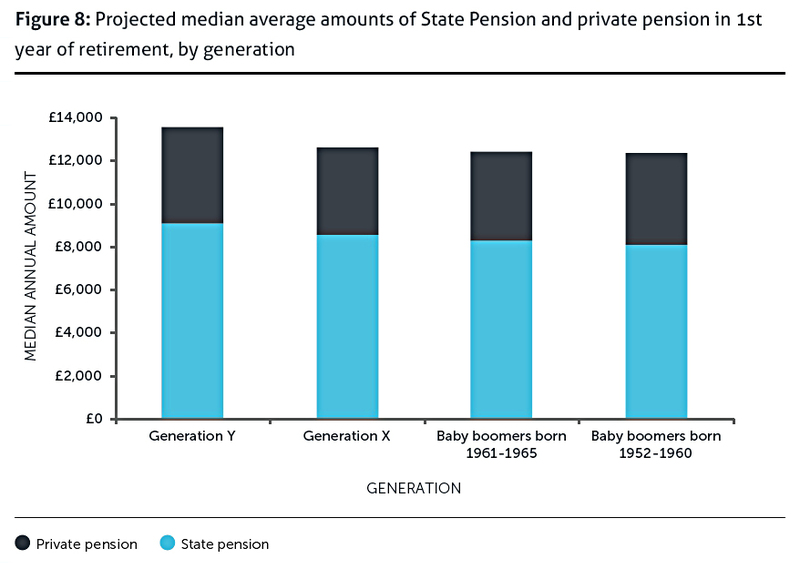 And indeed the hypothesis that future generations would benefit more from the SP, although it is accepted that at typical 8% rates of auto-enrolment they will need it more relative to their private pensions. 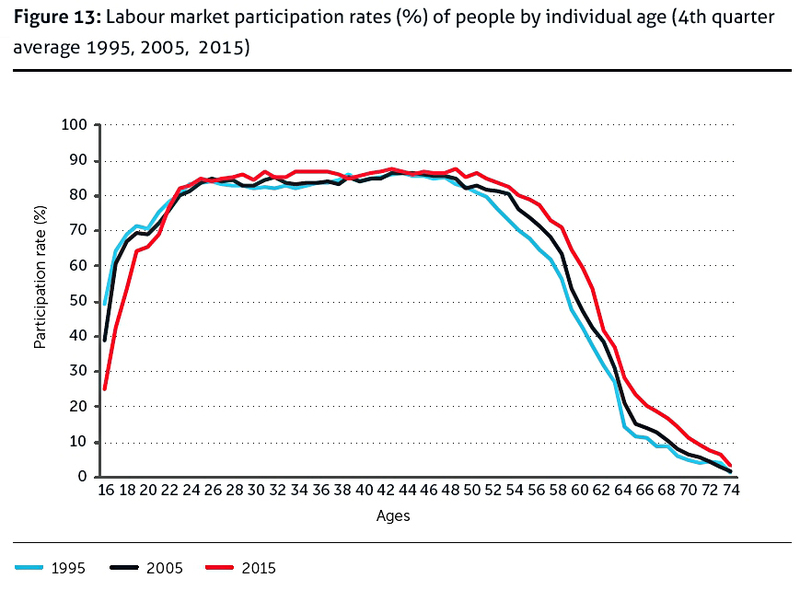 And the shift towards longer working lives, although perhaps distorted in the 1990s by large companies culling a lot of what they saw as dead wood by offering voluntary early retirement and early pension payments. Hi Mike, I’m new to this blogging game…. However, I do have first hand knowledge of the pension position for those women aged are now 60+ but who suddenly found they had to be 66 to get their state pension. I was born in Aug 1955, not quite as bad as those born in Apr 1954, but close. I was also one of those who found themselves on the wrong side of the ‘contracted out’ divide. With the result that despite 38 years of NI contributions, my pension forecast was only £116. I heard a Radio 4 program about a year ago, which said, even though I was retired, I could pay back extra years NI. I rang NI, who said, I couldn’t get a decision until April 2016 because of the change in rules. I finally got round to it on 1 Sept. I agreed to ‘pay back’ 4 years of NI since my retirement in 2011, with an expected £16 p.w. increase, for a cost of £2,650. Good value really – yes I have to live to 70+, but there’s a fair chance of that. When I eventually find out the status, I’ll post a comment here. Sorry to hear that, Erith. Let us know what they say. Hi Mike, I left a note on a February state pension post. On chasing in November I was told to request a new estimate, which I did. Still no increase. I chased again a couple of weeks ago. It would appear I was incorrectly advised – in my specific circumstances, the back payment had no effect, but moving forward, if I make payments from April 2016, they will work. I have requested a refund! Just as well, I have a year or two to sort it out! Yes, I remember your earlier comment. The way it seems to work is that there are two systems, and you are given a base pension for your contributions to the old system, then you need to make more contributions via the new system to get your pension up to the £8K pa limit. There was a top up-scheme for the old system, but I think you needed to be receiving your pension by April 2016. I’m surprised you were able to make top-ups that didn’t help. Today's post is the fourth in what was planned to be a three-part series about Pension Deficits.